About a year ago, for environmental reasons, Clif and I decided to stop eating beef and pork. In addition, we don’t eat much fish or seafood—even though we love it—because we have come to believe that there is no way the oceans can sustainably feed so many people on this planet. (For more on this, watch Mission Blue, the terrific documentary about the oceanographer Sylvia Earle.) We do eat some chicken, often organic but at the very least antibiotic free. Most of the time Clif and I are more than happy with our plant-based diet. He could eat my vegetarian fried rice once a week, and my bean burgers, based on a Mark Bittman recipe, are pretty darned good if I do say so myself. Nevertheless, at times we do miss the texture and taste that ground beef brings to such dishes as chili, spaghetti sauce, or tacos. We could certainly use ground turkey or chicken, but we don’t want to eat too much poultry, either. Besides, nothing can really compare with the umami of ground beef. We’ve tried texturized vegetable protein (TVP), and it’s about as appealing as the name suggests. TVP has a blah flavor, and it brings nothing but, well, texture to chili and spaghetti sauce. We scratched that one from our list long ago. More promising have been MorningStar Farms crumbles. While they don’t have the smooth and mellow taste of ground beef, these crumbles aren’t as tasteless as TVP. They are fairly expensive, and for those who live on a modest budget, the crumbles would have to be a once in a while kind of thing. Unless, of course, you can find coupons for them. Not long ago, I learned about other meatless meat products made by a company called Beyond Meat. On a recent show, Tom Ashbrook, of On Point radio, featured Ethan Brown, the CEO and founder of Beyond Meat, which manufactures fake chicken and beef made from pea protein and soy. While doing the show, Tom Ashbrook munched on one of Beyond Meat’s burgers, and he indicated that he liked it pretty well. 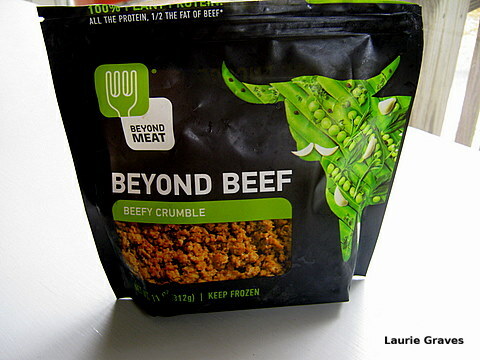 Naturally, Clif and I were curious about Beyond Meat, and we were eager to try it, too. We had a coupon for the product and a very good thing as Beyond Meat is not cheap—an 11 ounce package costs $4.99 at Target. Therefore, with coupon in hand, Clif duly picked up a package of Beefy Crumble, and last night I used it with a jar of spaghetti sauce. The results? So-so as far as I was concerned, and I thought the MorningStar Farms crumbles had a better flavor. While the Beefy Crumble wasn’t as bland as the TVP, it was certainly bland enough. The texture was good—I’ll give it that—and the Beefy Crumble had a satisfying chew. But other than that, it didn’t bring much to the sauce, and I would rather have mushrooms, peppers, and zucchini to add taste and texture. Clif understood my point of view, but, to him, the pleasing texture more than compensated for the bland taste, which he said he liked. What next? As long as I have some coupons, which I do, I would be willing to try some of Beyond Meat’s other products—the chicken, the meatballs, maybe even the Feisty Crumble. However, after eating the Beefy Crumble, my expectations are not high. In the end, I expect Clif and I will stick with our simple homemade meals made directly from vegetables. If Everyone were to stop eating meat, and the population remains at 7 billion… on continues to grow… of what good is that decision? Humans are emptying resources at a rate that no dietary change can even begin to address. Forgive us if these statistics are off… but they’re in the ballpark. In North America , there are about 80 million cattle. Back in the day, there were 60 million bison. Not a big difference, and when you consider that bison are quite a bit bigger than cattle, even less difference. In 1800, with 60 billion bison and millions of other animals on this planet, there was no environmental crisis. Animals – and eating them – is not the problem. Overpopulation – of humans – is. Have a steak… or a cob of corn… or whatever you enjoy eating. But if we don’t collectively develop the courage to begin a dialog about overpopulation, we are doomed. Barbara & Jack, I understand your point of view. It seems as though the actions of two people can’t have that much impact. However, Clif and I know that the only actions we can truly control are our own, and we are committed to living lightly. Who knows what might happen if two more people choose to live lightly, then two more, then two more…Why, you just might have a movement that indeed makes a difference. We agree that overpopulation is a serious problem, and in the 1800s, when the buffaloes roamed the human population was significantly lower than it is now. Even so, with lower numbers, we humans nearly drove the buffaloes to extinction. Taming our appetites has always been important, even with less people. Clif and I will pass on the steak, but we will go for the corn. And believe it or not, we like our plant-based diet. I was a vegetarian for a few years but my husband had no interest. I was lucky enough to find local, small farms and I buy meat from them. I lost my taste for it since giving it up so I eat very little of it but for us, this has been a good compromise. Cynthia, your solution sounds very good. Different situations call for different actions. Clif and I both love vegetarian food, so cutting back on meat works well for us. Good for you for keeping an ethical diet and considering the consequences of our food choices! My wife is a vegetarian and although I eat meat (not often) I only eat it if it came from our farm (I call myself a farmitarian). As you are searching for a beef substitute, you might consider venison. I quit eating beef long ago, in part because I concluded that cattle farming is ecologically unsustainable and inefficient. Nowadays I get all the red meat I want (for tacos, spaghetti sauce, chili, meatloaf, etc) from venison. Deer are the ultimate free range natural meat source and the deer population explosion that has occurred as humans have abandoned hunting game in favor of factory-raised meat is doing great environmental (and human) damage. Today there are an estimated 30 million deer in the U.S. (more than 100x the number of just a century ago). If you’re not already eating venison, you should consider it. It is delicious, healthy and (for those who eat meat) environmentally responsible and from an animal-welfare perspective preferable to eating meat from confined animals. Just fwiw.